At Ruby Mountain Chiropractic Center, we provide practice members with an array of effective techniques and services to get them on the path toward relief and healing. 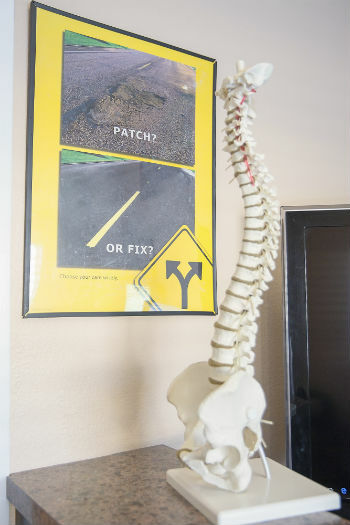 What makes our office unique and different in our area is not only do we offer a path toward pain relief or what Dr. Wendell refers to as “patch care,” we also offer a problem-focused approach. Using the most scientific and valid techniques available, Clinical Biomechanics of Posture (CBP), not only can they attempt to identify the probable problem behind your pain, but a potential solution as well. With CBP, we’ll take x-rays of your spine and compare these to normal. We’ll point out any abnormalities that are measured. These deviations from a normal and healthy spinal position can help direct treatment options including one that attempts to restructure your spine back toward a normal and healthy position. CBP has been shown to give a person not only long-term pain relief but problem relief with the potential of improved overall health as well. Spinal Adjustments to help restore segmental integrity to the spine, decrease abnormal weight distribution and avoid spinal degeneration. Mirror Image Traction delivering constant force to help retrain and remodel the spine and spinal ligaments to counter the effects of long-standing postural alterations. Mirror Image Exercises, designed for each patient’s particular spinal abnormality, are used to strengthen weaker areas of the spine and change. As the spine moves toward normal the spinal cord becomes more relaxed and your nervous system starts to work the way nature it designed to. Often times amazing side effects ar noticed from a healthy and optimally functioning nervous system. People often report these include decreased allergies, increased immunity, better sleep, improved energy, positive mood changes, improved digestion, improved breathing, a better sense of wellness and more. K-laser, has set the standard for cold laser therapy and can be used in conjunction with regular chiropractic visits. A laser was originally theorized by Einstein to be possible. Cold light laser, which increases cellular metabolism, is used in the body for healing. This laser uses that light frequency and can penetrate up to 6 inches. The K-Laser can speed up the healing process. It can help those with acute injuries like sports injuries and more chronic conditions. If you’d like to experience pain relief and better health, contact us today to book an appointment!